What Colliders do, and how to setup different collision geometry with primitive, compound and mesh colliders. has a rigidbody component attached. a sphere, a capsule and a box. 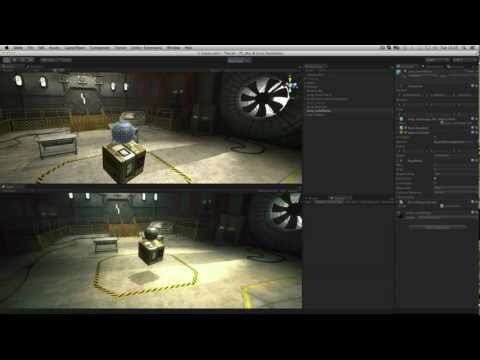 primitive colliders to different objects. but instead uses a mesh collider. a collision mesh and effecting performance. to make a compound setup instead. geometry and still use a mesh collider. as this for the collisions. then applied to a series of mesh colliders. that we've created for it. a simplified set of geometry. has a sphere collider component and a rigidbody component. The rigidbody provides mass and gravity. The power cube has a box collider attached to it. This script checks for three collision events. to the console using Debug.Log. and when Exit is called. for a while and then Exit is called. As I continue OnCollisionStay is occurring. two colliders are still in contact. must have a rigidbody component.